COMMENTARY ON "THE HOLY SPIRIT AND THE CHURCH"
This week’s lesson builds its entire argument on an unacknowledged assumption: the straw-man argument that the Seventh-day Adventist Church is God’s remnant church of Bible prophecy. It assumes that Adventist doctrines and practices are biblical truth, and the lesson further assumes that biblical explanations and Christian arguments can be applied to the Adventist Church simply on the basis that the Seventh-day Adventist organization defines “church” as “itself”. In reality, however, Seventh-day Adventism is not part of the Christian church. Adventism did not grow out of the apostolic gospel; rather, it grew out of the heresy of Arianism, the anti-trinitarian beliefs of Joseph Bates and James White who had been members and pastors in the anti-trinitarian Christian Connexion. Adventism does not endorse the biblical gospel, that Jesus died for our sins according to Scripture, that He was buried, and that He rose on the third day according to Scripture (1 Cor. 15:3-4). Oh, the affirm these facts, but they do not teach or believe that these basic components ARE the GOSPEL. They do not believe these three things are all one must trust in order to be saved. Adventists believe that the Sabbath is part of the gospel, and they believe that the second coming is also part of it. Moreover, they insist that the “health message” is the “right arm of the gospel”, and they also call the Three Angels’ Messages “the gospel in verity”, as Ellen White declared it to be. No, Adventism does not teach or believe the biblical gospel because it is founded on a false, non-trinitarian god and a Jesus who is not fully, eternally, almighty God. Even though the organization has a trinitarian-soundings fundamental belief now, it still does not teach the real Jesus. The Adventist Jesus no longer possesses the attribute of omni-presence because He now has a body. The Adventist Jesus does not have the “same substance” as the Father and as the Holy Spirit. Moreover, the Adventist Jesus could have failed in His mission. He could have sinned, and if he had, the universe would have been plunged into chaos, as Doug Batchelor affirms. Adventism believes that the Godhead could have been broken had Jesus failed—and they believe that such a horrific thing was actually possible. They believe God risked the Trinity by sending Jesus. This Jesus is not God the Son of Scripture. Without the biblical Jesus being the ground of truth, without the biblical gospel of the Lord Jesus being the absolute foundation, the Adventist organization cannot be part of the universal church. Individuals within Adventism may have placed their faith and trust in the Lord Jesus alone, but they have done so IN SPITE OF Adventism, not because of it. The organization is a false church. Even though they have adopted Christian words and terms, their understanding of those words and terms are not biblical, and their beliefs add to the gospel, subtract from the finished work of Christ, and divide the body of Christ by saying Christians who worship on Sunday need to leave their churches and join the Adventists. Finally, Adventists add to the gospel by requiring the Sabbath and by adding an extra-biblical prophet to their theological framework. While examining the words does not yield overt heresy, then idea presented is never stated in the Bible. The Bible says that when we believe in the Lord Jesus, we pass from death to life (Jn. 5:24). This passing from death to life is the event of being united with Christ. We literally are changed from being dead to being spiritually alive. We are reconciled to God because we have accepted the death and resurrection of the Lord Jesus as our substitute penalty for sin. The Bible states that when we believe (and we have already seen that “belief” is how we pass from death to life and are thus united to the Life Giver), we are then “sealed” by the promised Holy Spirit who is—not the means of united us to Christ, but the guarantee of what is to come (Eph. 1:13-14). We are united to Christ by believing and being made alive; we are then sealed by the indwelling Holy Spirit and thus equipped for service and ministry. The body of Christ, all those who have placed their trust in the Lord Jesus alone, are unified by the one Spirit. While the words of the lesson sound good and do not ring overt “heresy bells”, they nevertheless are not speaking in biblical terms and completely eclipse the gospel call of Scripture. First, the Bible never says or implies that believers are baptized into a specific church body. Baptism, in fact, is never taught as an entrance rite into local church membership. Baptism is into Christ, not into a church. Because belief in Christ causes us to be transferred out of the domain of darkness into the kingdom of the beloved Son (Col 1:13), we are grafted into the universal church, the body of all believers who have ever trusted Christ. This membership, in fact, is unique for believers post-Pentecost. Old Testament believers were never part of the church, although they are God’s people. The Church is specifically a New Testament phenomenon and is composed of all who have trusted Christ. Its members are both in heaven with the Lord (if they have died) and alive on this earth now, but they are not part of Israel. Israel is a separate body. Second, Ellen’s comment that at baptism, self is “by profession dead to a life of sin” is completely unbiblical. Scripture never says that our death to self and sin is “by profession”. We do not make a promise to give up sin and thus be counted as God’s child. Our death to sin is 100% God’s work in us. We are made new, given a new heart and mind. We still have sinful flesh, however, as Paul explains in romans 7, and our flesh still has a “law of sin” in it. Those sinful impulses we must submit to the Lord and to His word’s instruction on an ongoing basis, but our being made new creatures has nothing whatsoever to do with a “mutual pledge”. Jesus’s death, burial, and resurrection is an eternal, once-for-all fulfillment of the law’s righteous requirements. When we trust Him, His own personal righteousness is credited to us. We do NOT make a pledge with Him as Israel did. The New Covenant is made and kept between the Father and the Son. We are brought into it by the grace and mercy of God, not on the basis of a pledge, but on the basis of the Lord Jesus’ unfailing and completed work. The New Covenant is not conditional as was the Old Covenant. We do not promise obedience in exchange for God’s blessings. Instead, Jesus’ “better promises” guarantee our blessings when we believe and are born again; we simply believe, and then, when we are made alive, we can learn to submit and obey. Our obedience, however, is not a condition of belonging to Jesus’ body. Tuesday’s lesson focusses on the word of God, and it is mentioned throughout the week’s lessons. When the lesson refers to the Word of God, however, the implied meaning is “Adventist doctrine”, or Adventist biblical understanding. Of course these words are true. In the context of the Sabbath School lesson, however the meaning is much more specific; the write is saying that the Holy Spirit will never draw people away from what Adventism says the word of God teaches. In other words, they are implying the Spirit will never lead people away from Sabbath-keeping or from the idea of Adventist “soul sleep”—or away from the idea that Ellen White was called as God’s messenger. Furthermore, they are saying the Spirit will never lead people away from the “pre-advent judgment” or from the idea that Jesus made Lucifer jealous—a teaching that is 100% missing from Scripture. Because Adventism is founded on “another gospel” that is not the apostolic teaching, these words can sound “right” but in practice be “wrong”. In the context of Adventism, these words bind the readers’ consciences even more firmly to Adventist teachings at the one true way to be “right”. Wednesday’s lesson only confirms this understanding of the lesson’s words. 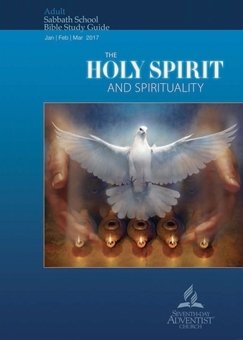 The title declares that “The Holy Spirit Unites the Church in Faith and Doctrine”. Yet when they say “faith”, they do not refer to the simple act of placing one’s faith in Jesus. They refer to the “Adventist faith”, or to the body of Adventist beliefs. No, the Holy Spirit does not unite the church in “faith and doctrine” as Adventists define it. Ephesians 4 explains that we grow in unity in the Holy Spirit. We have “one Lord, one faith, one baptism, one God and Father of all, who is above all, and through all, and in you all” as the lesson quotes, but the lesson implies that “one faith” is the Adventist body of belief. It is not! We are unified by the Spirit as we hold to the one Faith—the faith in the Lord Jesus and His finished work. The apostle’s teaching, as we see throughout the book of Acts beginning in Acts 2 on the Day of Pentecost, was always a history of God’s call on Abraham, the development of Israel, and the facts of the Lord Jesus and His fulfillment of all the prophecies and the law. Jesus even prayed, in John 17, that the Father would bless His disciples and all those who would believe through their words. The apostles’ teachings did not include keeping the law; they were only the truth about Jesus. The lesson added the words “united in Bible study” to “continually devoted themselves to the apostles’ teachings” because Adventism simply CANNOT be squeezed out of the New Testament. It requires a convoluted reading of the Old Testament even to shape Adventist doctrine. Adventism is deceptive. It is not biblical; it is based upon a false prophet’s dictums and interpretations, and it misuses the words of both the Old and the New Testaments. The Holy Spirit does carry out the work of the Lord Jesus through the church, but the Adventist organization is not the church. The way this lesson explains the Holy Spirit is not the way the Bible explains Him. I challenge you to read the book of Ephesians as you prepare for the Sabbath School lesson this week! It’s only six chapters, and it describes the body of Christ far better than the lesson does. Copyright 2017 BibleStudiesForAdventists.com. All rights reserved. Revised February 27, 2017. This website is published by Life Assurance Ministries, Camp Verde, Arizona, USA, the publisher of Proclamation! Magazine. Contact email: BibleStudiesForAdventists@gmail.com.